We want to thank Jan D. for pointing out that we had a few inconsistencies in our Green Gardeners Make a Difference Photo Contest rules. We have made some modifications so that the contest now lists all of the cities, counties and jurisdictions that are allowed to enter. We have also added a few extra days to the contest deadline, in order to allow a little more time to anyone who was confused by our contradictory contest conditions. 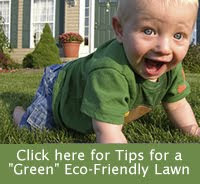 And don’t forget to include a brief description of WHY the photographed aspect of your yard is eco-friendly. Since Father’s Day is June 17th, this gives you a great excuse to spend some time with Dad in the garden. Just remember that if you include Dad in the photo, you have to get him to sign a model release! P.S. I saw some really cute pictures of Bo Obama in the White House garden today, so if Michelle decides to enter one of those photos in the contest, then the competition might be pretty fierce! Otherwise, it’s going to be a close competition when the voting begins on June 25th.